Been a while since I posted, and I'll try to catch up in the next few days. I'll also try to write some more "informative" posts, as I've got some people asking for that kind of content. Anyway, here is what I wore on Friday. The occasion was a bit more formal, and I was trying to find a balance between a kind of classy night look and playfulness. 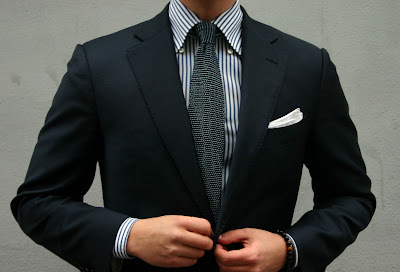 The jacket is navy wool with a softer shoulder, the shirt a bd shirt of the more formal kind, worn with the collars unbuttoned, and a bi-color knit tie. 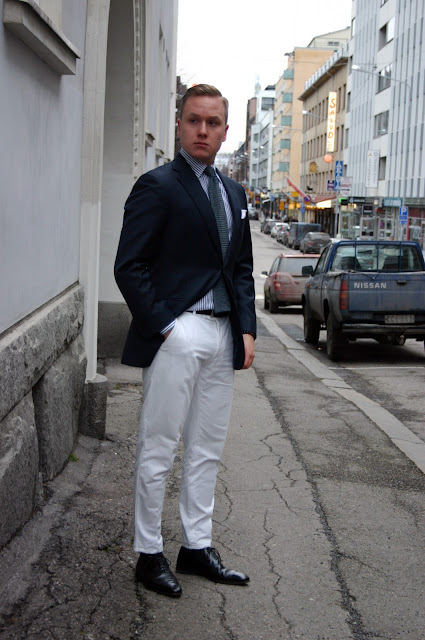 White chinos and a midnight blue oiled suede belt. A shot for more detail. 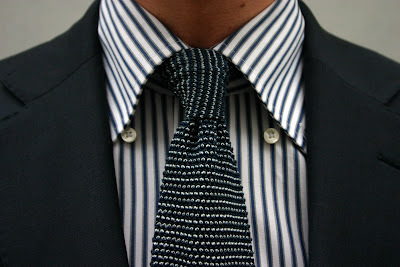 Quite like how the collars on the shirt roll when worn like this. 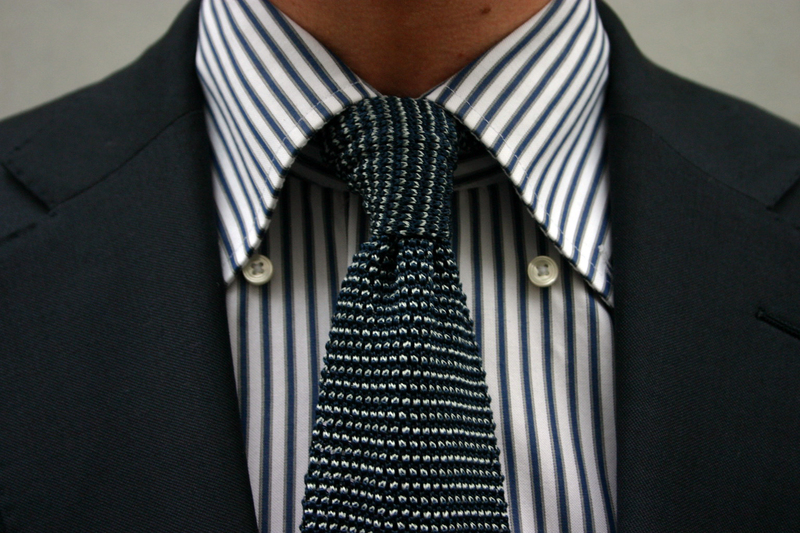 The tie could use a tightening, seems I was a bit sloppy re-tying it after having a haircut. No shoe picture, but I had a pair of black plain toes and navy socks. The overall outfit was meant to be a sort of playful and modern yet classy night out outfit, and I think this one pretty much pulled it off. White pants in the aw? I always wanted to do that, just to see how people react, but I never dared. Don't you wory the trousers will get ruined at the party? Hi! Nice style! Where do you get your jackets from? I'm actually a bit cheap when it comes to knitwear. That's why I mostly use H&Ms jumpers, as they cost nothing and have a perfect slim cut that I like. Their designs are often quite simple and good, and for the money the quality is often good. The blue cardigan is from SuitSupply. I have a bit mixed feelings from their knits, as some have been really terrible. However, the cardigans this F/W season are pretty decent for the money. They are quite thin (and a friend of mine had his rip instantly from a seam), but very soft and quite warm. Not sure if they are going to last for many years though.